To contemporary Americans, the Armistead family’s treatment of the Star-Spangled Banner—marking up the stars and stripes with signatures, cutting off pieces to give away as souvenirs—might seem strange or inappropriate, even though it was customary at the time. Today an extensive set of rules, known as the U.S. Flag Code, defines the proper way to treat the American flag. But in fact, these rules and customs surrounding the flag date back only to the late 19th century. 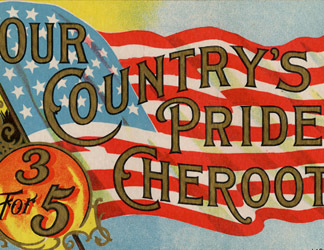 Led by Civil War veterans who wanted to uphold the sacred character of the national emblem they had fought to defend, the first efforts to restrict uses of the flag were targeted at commercial and political advertisements. While the federal government did not pass any flag desecration legislation until the 1960s, by the early 1900s most states had adopted such laws, and in 1907 the U.S. Supreme Court upheld a Nebraska statute in a case against a manufacturer of “Stars and Stripes” beer. The flag-protection movement regained national momentum during World War I, and on June 14, 1923, the first National Flag Conference was held in Washington, D.C., to establish a set of rules for civilian flag use. The U.S. Flag Code, first published in 1923 and adopted by Congress in 1942, is based on the belief that the American flag “represents a living country and is itself considered a living thing.” It proscribes any use of the flag that could be construed as disrespectful, including using it for advertising and to decorate clothing and other goods. While the U.S. Supreme Court struck down flag-protection laws as violations of free speech in 1989, the Flag Code is still maintained as a code of etiquette, enforced not by law but by tradition. True or False, the rules and codes of etiquette spelled out in the Flag Code can be legally enforced. 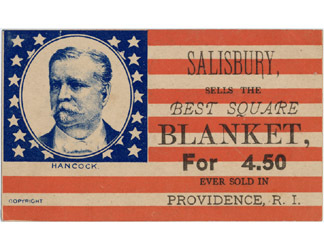 In an efficient combination of political and commercial advertising, the red and white stripes of this flag promote a dry goods company in Providence, Rhode Island, while the blue canton carries a portrait of General Winfield Scott Hancock, the 1880 Democratic presidential candidate. 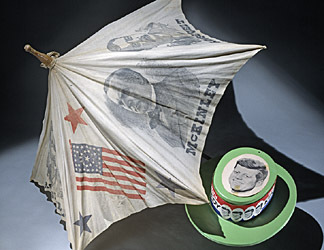 Some of the earliest court battles over flag desecration focused on tobacco and alcohol advertisements, which were criticized for linking the flag to immoral habits. The American flag figured prominently in the 1896 and 1900 presidential campaigns, both of which pitted William McKinley of the Republican Party against Democratic nominee William Jennings Bryan. In the 1920s, when the U.S. 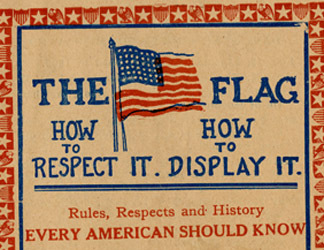 Flag Code was created, teaching respect for the flag was considered an essential part of “Americanization,” the process of assimilating immigrants into loyal, English-speaking citizens.